Did you know that Liverpool holds the Guinness Book of Records title for being the Capital of Pop? More artists with a Liverpool origin have had a number one hit than from any other location – and of course, it’s the city that produced pop legends The Beatles. And now the metropolis has done it again. Liverpool has just been recognised as a City of Music by the United Nations, earning the accolade due to music’s ‘place in the heart of the city’s life’, following a bid by Liverpool City Council. In celebration, we’ve put together a few handy ideas for groups visiting the city, so you can explore Liverpool and celebrate with a song and a dance at the same time; starting with the big one, The Beatles Story. 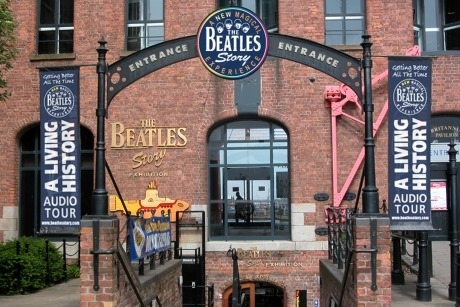 It’s an award-winning experience in the heart of the historic Albert Dock, and the world’s only permanent Beatles exhibition. The Beatles Story offers an impressive multi-media insight into the life and times of one of the world’s greatest bands, and when it’s time for a break it has a Beatles-themed coffee shop. Group rates for the attraction are available for parties of ten or more. For even more Beatles-themed fun, take a Magical Mystery Tour. The tour visits 30 locations, including The Beatles’ former homes, schools, Penny Lane and Strawberry Field. GTOs benefit from discounted rates and bespoke tours are also available. The Magical Mystery Tour ends at the place where The Beatles’ musical identity was formed. The legendary Cavern Club is open daily with live music every afternoon from the Cavern’s resident musicians, and admission is free with a tour ticket. Exclusive private tours are also available for groups for two or four hours in one of the Magical Mystery Tour vehicles, or you can book a guide to join your own minibus or coach to take your group on a tour. Echo Arena Liverpool is another venue in the city with plenty going on – and the free coach parking, pick-up and drop-off points, plus various group discounts (dependent on each event) make this arena perfect for parties looking for a concert to attend. Some of next year’s highlights have been confirmed as Peter Andre, the X Factor Tour, The Wizard of Oz, Bryan Adams and Elton John. And for even more live music at a jam-packed event, get your group grooving at the Liverpool International Music Festival. The event has seen previous acts like Rae Morris and Alesha Dixon grace its stages. The festival is free; Matthew Street is the central location, while many other locations across the city have live music for visitors. For further information on Liverpool visit www.visitliverpool.com.